[Per] hour of elapsed time, man and boy, we probably have been happier when mildly looking into the ruddy cup than at other times. Even granting our lethal morning-after disease we question if willingly we would exchange even our hunting, fishing, or blue water sailing experiences for those mellow and gorgeously spiffed hours! . . .how about the time after the Art Students' League Ball on 57th Street, across from licit Carnegie Hall, and we went with a girl who unexpectedly turned out to be painted half in gold and half in silver under her evening wrap; later ending up in our Arab Sheikh's burnous and red turned-up-toe shoes doing telemark turns through the snow to lace a pink satin corset on the front of General Sherman's statue at the Plaza? Does anyone dream that raspberry vinegar could produce a triumph like that? No, I guess not. This easy recipe comes from Baker, and I first was pointed to it by the estimable Chuck Taggart, who not only pointed me towards cocktails but pointed me towards good ones and reliable sources. For years now, I've pored over his recipes, and was always intrigued by Tequila por Mi Amante, or "tequila for my beloved." Why'd it take me so long to try it? The titular beverage is a simple infusion of strawberries in tequila...but oh, it's so much more. 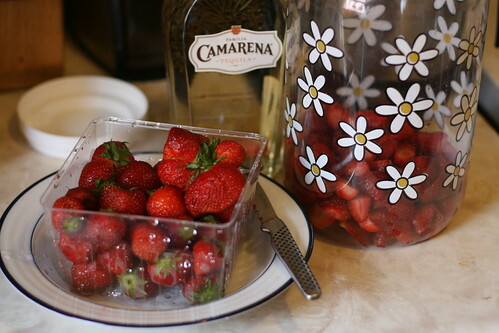 One fine day in early June, when the berries at the farmer's market were at their peak, I washed, hulled, and halved a couple quarts of strawberries, covered them in a large jar with a bottle of reposado tequila (use the 100% agave stuff, and definitely go for the reposado -- you want something with a little age and character), and tucked them into the refrigerator for three weeks. Every day or two, I'd take the jar out of the fridge and gently shake it. Strain out and discard the berries, and you're done, though Chuck suggests letting it age in the fridge for another three weeks or so. Baker says "This berry process extracts some of the raw taste, adds a rosy dawn touch. Our Mexican drinks it straight always. We opine that handled in the same way as sloe gin, discoveries would be made..." and what do you know, he's right. The finished product is a gorgeous red in color, "like a beautiful, brilliant ruby", and the tequila's acrid bite has been softened by the berries' fruitiness. It's good -- really, really good -- on its own with maybe a splash of lime, but Paul Clarke had an even better idea: use it to make Palomas. [grapefruit soda is] sweet, but not very, refreshingly tart, and a little bitter. What it isn't, however, is alcoholic. . .So to make it Mexican, just pitch in a little tequila, right? Not quite. You know that business with the tequila, the salt, and the lime wedge? Pitch the whole thing in. Then you've got La Paloma, perhaps the most refreshing triple-H remedy ever created. Sweet, sour, bitter (a little), and salty, it's got all four taste groups, plus ice, bubbles, and hooch; what's not to like? We don't know who first assembled it or named it. . . But in the summer, in New York. . .we regard this unnamed genius as a benefactor of humanity up there with Albert Schweitzer and the guy who invented the deep fryer. But if you sub out the regular tequila with the Tequila por Mi Amante? It sends your taste buds straight into orbit. This recipe looks simple and a bit obvious, I know, but damn if it isn't utterly perfect, especially on one of those triple-H (hundred-degree-heat, hundred-degree-humidity) kind of days. It really is. Try it yourself. You can still get halfway decent strawberries, and six weeks later your tastebuds will thank you. Build in a Collins glass over plenty of ice, and top up with the grapefruit soda. Give it a quick stir, and stand back. Hooray! 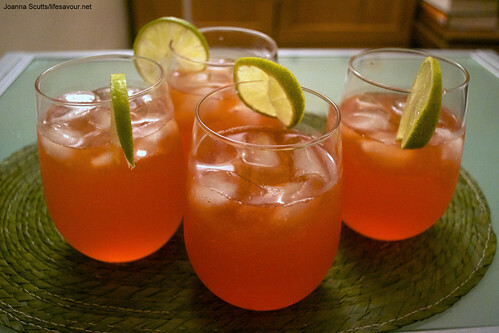 Palomas por Mi Amante are truly one of my all-time favorites. I also find that Tequila por Mi Amante—especially if you make it with good quality stuff, as you suggest—is a great reintroduction to those that have foolishly sworn off tequila (invariably citing a single night of youthful overindulgence in rotgut cactus juice).